It’s hard to believe the first week of July is already in the books. Bush lakes have been producing all year, I expect that to start slowing down as water temps are creeping up into the low to mid 70’s. The region has just experienced inches of rain in just a few days which is allowing access into some great “July” water. All lakes have their own personalities, some are good in the spring, some are good in the fall, and yes, some are better in mid summer. There are not to many lakes anywhere that fishing is good all the time. The secret to this is knowing the lakes and when to get the most out of them. Outpost fishing this year has also been outstanding. A quick trip up there a few days ago for wood cutting and maintenance allowed us to wet a line. Walleye are still easy to catch and northern pike in the 30’s were abundant. Musky fishing is spotty mostly because of weather fronts that pop in every other day or two. Action will be more steady as our weather heats up and levels out. A quick outing last night yielded a buddies first musky , but we did not raise any other fish. Weed growth is getting there and water temps are just about where they need to be for the summer feed. Lac Seul out of Scout Bay is a bit off so far this year, I expect this to turn around shortly. Even being a little off, fishing is still good but could be much better. I have had mixed reports from the north end of the lake and mixed reports out of Williams Bay as well. The amount of moose sightings have definitely been encouraging. Our customers have seen several cows with one or two calves in many different areas. 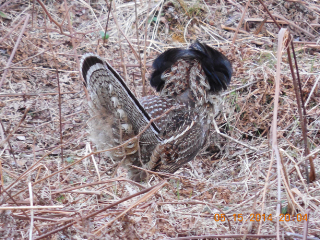 Grouse have had their chicks and seem to be everywhere. Just like this years spawn things are happening fast. Water temps are heating up, water levels are dropping, and the hatches are in full swing. Last week the trout were still shallow and on the feed, good numbers and size. 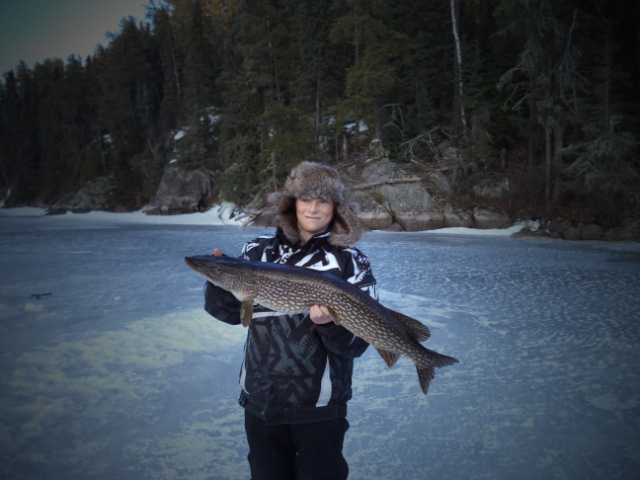 Northern Pike action was steady with several mature fish in the mid 30’s were boated. Hot sunny and dry sums up are weather pattern but the stable weather should bode well for the first week of walleye fishing. It’s early and we don’t have wide reports yet but early indications are good. Our fisherman boated 15 to 40 walleyes per boat, not great but not a bad first day. We will wait a couple of days and get a more detailed report on the walleye action. 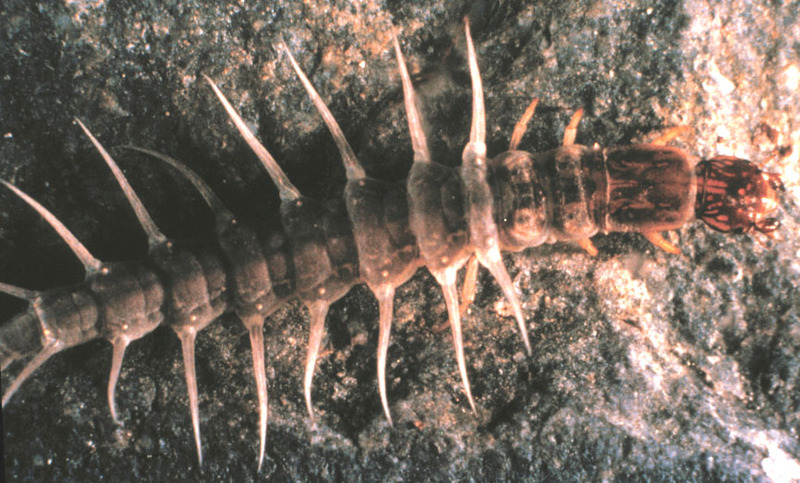 With mayflies and every other water creature starting their hatches fish shallow on mud flats that transition to rock and you will have action, 3 to 7 feet of water. Water temps on walleye water are ranging between 58 and 65 degrees. Lets hope for a bit of a cool down and some rain to keep things going into June. For everyone who loves black flies you are missing out. The melt is on and NW Ontario is waking up from another quiet winter. Ducks are back and extremely active. Our duck boxes are hosting Golden Eye, Hooded Mergansers , and a pair of wood ducks are back. Betty got to witness our food chain a few days ago as an otter took down a duck not too far from the dock on Pickerel Creek. 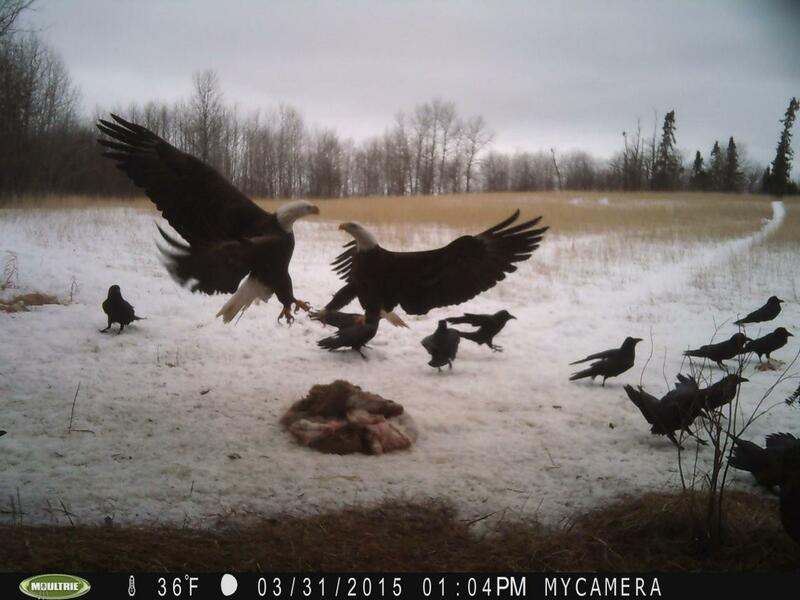 There has been so much duck activity even eagles are trying to get in on the action and are trying to snag a duck dinner. Sand Hill Cranes have started their flight back north, a great sign that a new season is about to start. Deer and moose would have had a fairly easy winter, sighting of both animals have been prevalent as of late. Over an inch of rain last week and some decent run off have water levels high across the region. Pickerel Creek itself has morning temperatures right at 40 degrees but warming up to the high 40’s by the afternoon. Creeks have been open for over a month now and with warm water flowing into our area lakes northern pike have begun there spawn. We still have ice on our lakes but it is starting to go pretty quick over the last few days. We did get good trout reports from north of Ear Falls last week but ice conditions around here are no longer safe. If the weather man is correct it looks like we have just a few more days of winter like conditions. We received about 6 inches of fresh snow over the last two days and things look a lot like December. Augusta, Georgia sure looked pretty nice yesterday although Jordan Spieth probably wishes it was still December. Fishing reports have been good. We fished Saturday and had a great day catching the new little green fish in our area and then a quick trout fish in the afternoon, which panned out as well. Walleye reports have been decent. If you were to ask me a month ago if we would still be on the ice I would have said no way. 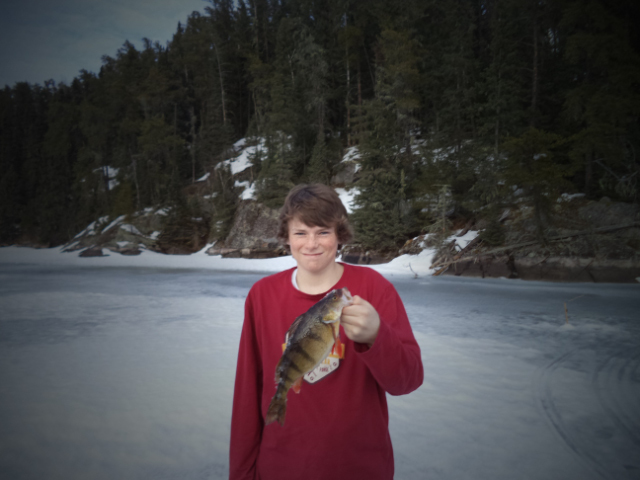 Ice conditions are very good, still averaging 16 to 20 inches, but you need to be careful anywhere there is current. We will be experiencing a warm up towards the end of the week and the long range looks to be average or above. 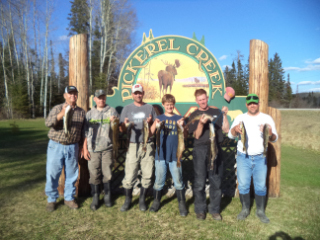 Pickerel Creek opened up this year on the 17th of March and it took until the 29th for our waterfowl to arrive. The creek is teaming with mallards, golden eye, hooded mergansers, Canada geese, and even a pair of trumpeter swans. There are not any signs of northern pike spawning yet but with warmer weather on the way it won’t be long to see the bull rushes dancing with another year of spawning taking place. Couple of reminders: Be sure to check your passports to make sure they have not expired and Highway 105 will be under construction north and south of Pickerel Creek Camp this summer so watch for workers and drive safe. Just a couple of weeks left for these good times. Betty and I would like to wish you and your families a very Happy Easter!!!! Walleye season will close the middle of this month and even though creek mouths are not open the walleye bite is on. Fish are staging close to their spawning areas and the prime time bite is fast and exciting. Good size slot Northern Pike are being caught in the same areas before the walleye move into feed. Trout are back on the feed after a few slow days in the past week or so. Ice conditions are still very good, 30 inches of ice on average, getting around is easy, four wheelers or fan cooled sleds are the way to go right now. Our long range forecast is above normal and lakes should be open a week or so before walleye season in May, my opinion anyway. 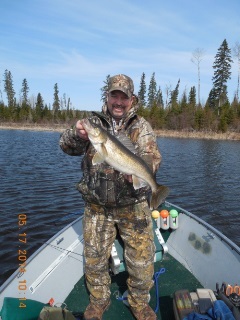 Walleye season always opens the third Saturday in May here in NW Ontario. This year the date is May16th,2015, but for all of you who book a year in advance be sure to recognize that the date will be May 21st in 2016. This will make a difference for people who book on spring holidays. Those weeks may not be open because season is pushed back a whole week. Because of our repeat business we book by the week of season, not necessarily the week on the calendar. If you have any questions give us a call. 807-529-3132. We have 2 openings at PCC this spring and one at Ogani Outpost, for those interested give us a call or shoot us an email. Good luck to all you Wisconsin Badger fans tomorrow night! We’ll be rooting for ya! Borrowed this pic from a buddy’s trail camera. Couple of nice pics of our buddy Cole from Little Canada Camp. 13 3/4 inch perch and a 34 inch Northern Pike. Wishing all of you a safe, happy and healthy holiday!!!! 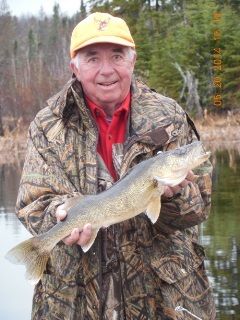 All of our guest had a good week of fishing even though the area in general has said to be spotty. Water temps on many bodies of water is still very cold, 38 to 44 degrees, smaller lakes are hitting 50 degrees in the afternoon. The ice is still on some lakes in Ear Falls and north. Lac Seul has main lake ice and Anishinabi Lake still has ice cover just to name a few. 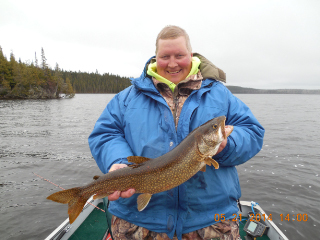 The small lakes have warmed up considerably and fishing will be getting better by the day. Pickerel Lake has female walleye on the bite right now and the larger numbers of fish will be seen when the males go on the feed. Suckers are in many creeks across the area telling us the majority of walleye and northern pike have finished their spawn. Hellgrammites have been found in the stomachs of many fish yesterday, could be why so many females are still hanging around there spawning area. Don’t be afraid to fish shallow right now, you can catch fish in a foot or two of water. For all you fall grouse hunters, everyone is seeing tons of birds. If we have a decent spring, this falls hunt could be a good one. Greg Heinrich (WS) with a nice laker. The Denney Family 3 generations of fisherman. (IA) Nice limit of walleye yesterday.